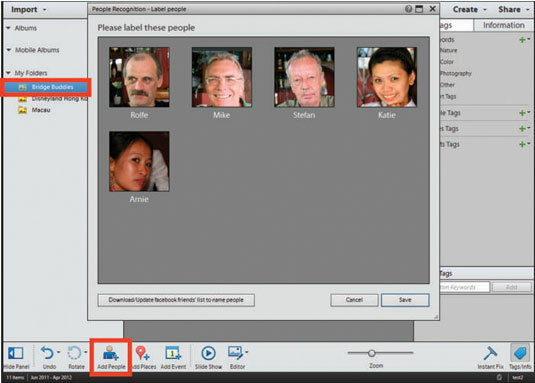 The Photoshop Elements 12 face-recognition feature enables you to tag people in your photos. For most people, the most enjoyable pictures are those of family and friends. You may take photos of landscapes and wonderful places, but quite often you’ll ask someone to stand in front of the Coliseum, Louvre, Grand Canyon, or other notable landmark. For just that reason, Photoshop Elements makes it easy for you to identify, sort, and view pictures with people in your catalogs. Add photos from a folder on your hard drive. Copy photos to a folder and choose File→Get Photos and Videos→From Files and Folders. Select the folder in the Import panel and click the Add People icon at the bottom of the Organizer. If you have several photos in a folder, Elements prompts you in a dialog box to confirm your action. Click OK if you see the prompt. The People Recognition – Label People window opens, as shown in the figure. You see the words Who Is This? below each photo. Click the Who Is This? text and type the name of the individual, as shown in the figure. That’s it! 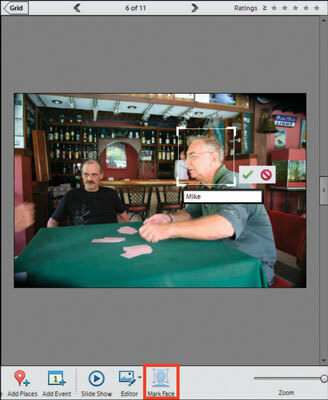 After you label the photos, you can easily search, sort, and locate photos with specific people. You can even download your Facebook friends’ list to the Organizer to help simplify labeling people. Double-click a photo in the Media Browser. You must first double-click a photo before proceeding. When you double-click a photo, the Mark Face tool appears in the Tools panel at the bottom of the Organizer, as shown in the figure. Click the Mark Face button. Elements adds a new rectangle that you can move and resize. 3.Move the rectangle to a person that hasn’t been tagged and click the Who Is This? text box. 4.Type the person’s name and click the check mark adjacent to the text box (shown in the figure) to confirm your action.